The Binder C 170 CO2 Incubator provides a stable and uniform cell growth environment with saturated humidity and sterilization, all in an easy to use instrument. This Cell Incubator is 5.9 cu ft in capacity with single piece stainless interior free of welding and built in condensation control that helps maintain dry walls while still achieving 90-95% humidity. This incubator also features a180° sterilization cycle with contamination free hot air, that runs overnight for efficient cleaning power. The Binder C 170 uses a drift free IR sensor, allowing users tight CO2 control that’s independent of the temperature or humidity, while the tight-fitting tempered glass door maintains the environment should users need to check on their samples progress. Settings for this CO2 incubator can be entered from the up-front LED display and microprocessor control, and includes diagnostic systems and a zero voltage alarm contact, with visual and audible alarms should parameters veer from set points. 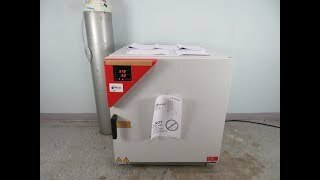 This Binder C170 CO2 Incubator is a Brand NEW Scratch & Dent Model. Incubator has been tested with a clean bill of health by our service team as part of our QC inspection. All of our lab equipment comes backed with our standard warranty. Should you have any questions, please don't hesitate to contact us.